For those people who are looking to do further research into Uriah Smith’s 1897 book Daniel and the Revelation I am trying to verify that EGW Research 2008 Software contains the original 1897 version of the book and not the 1944 or any later version. It has been said that “the version on the EGW CD-ROM called the 1897 edition is not from 1897 but a revised version from at least 1911“. 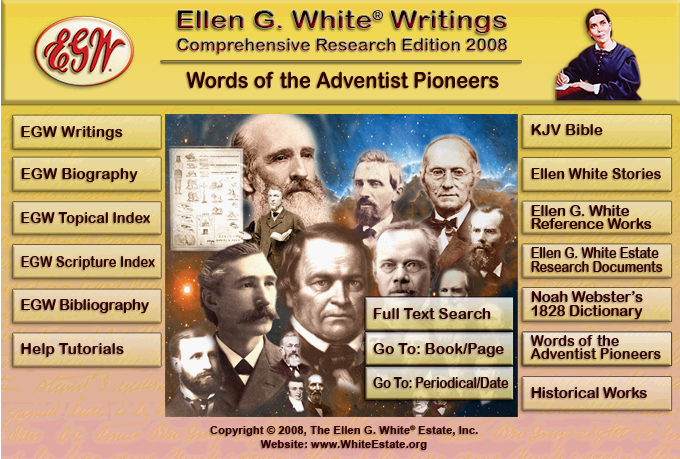 I’m not sure what EGW CD-ROM this is being referred to but as far as I can see the 2008 software by the Ellen G. White Estate contains the true 1897 version. That being said, I have not verified any of the Godhead comments that were removed in the 1944 version are still there. I have checked some of the deletions made in the first two chapters of the 1897 book and happy to say that they were in the 2008 folio views software. I will update the article if I stand corrected. Please consider commenting below if you have researched specifically if this is the 1897 version or not. Do you have any information pertaining to this software program containing Uriah Smith’s 1897 book and not some later version? Please comment below.